Survey results on a key planning commission responsibility: holding public meetings and hearings. Over the past 24 years, the primary focus of the Planning Commissioners Journal and PlannersWeb.com has been on assisting planning commissioners in being as effective as possible in their role -- including the key role of holding public meetings and hearings. We daresay that's a core function of just about every planning commission across the country. 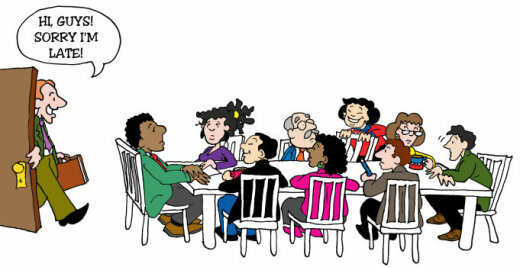 Based on your experience, what are the most important things a planning commission and/or planning staff can do in order to hold an effective public meeting or hearing? You can provide up to 3 responses. We received 950 comments from 379 individuals in response to this question. The three largest groupings of comments related to being well-prepared for the meeting; providing effective public notice; and running a meeting in a respectful manner, where members of the public were listened to and had adequate opportunity providing their comments. 1. Getting Prepared. The importance of what happens before the meeting was clearly on our respondents mind in responding to our question about what's necessary in order to hold an effective public meeting or hearing. A total of 136 individuals (36 percent of those who replied to the question) commented on the importance of commissioners being prepared for the meeting. A large number of those responding noted the importance of good public notice as a key element to holding an effective public meeting. 2. Notifying the Public. A large number of those responding (92 individuals) noted the importance of good public notice as a key element to holding an effective public meeting. A number of individuals mentioned the use of web sites or social media as ways of getting the word out about upcoming meetings. 3. Explaining the Process. Thirty-two people mentioned the importance of explaining the meeting rules and process at the start of the meeting. 4. Role of the Chairperson. Thirty-four specifically commented on the key role the chair of the planning commission plays in running an effective meeting. 5. Respect & Decorum. We received comments from 54 individuals which noted either the importance of showing respect to the public or of maintaining order and having a civil, non-threatening atmosphere during the meeting (we considered the latter to be closely related to showing respect to the public, and grouped them together in this category). 6. Listening & Keeping an Open Mind. We also grouped into one category the 39 replies that mentioned the importance of listening to what people have to say, with nine replies that spoke to commissioners needing to keep an open mind during meetings. 7. Receiving Public Comments. 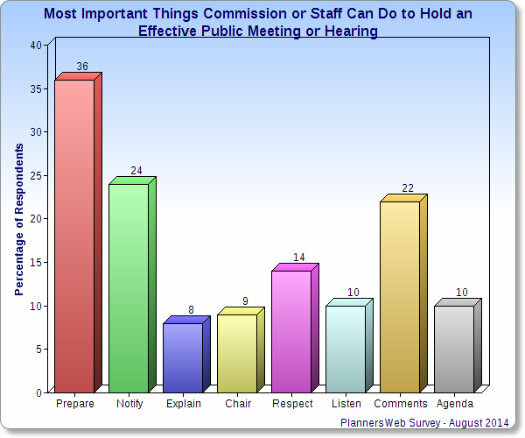 Eighty-four individuals indicated that properly receiving public comments was one of the most important things to running an effective meeting. A majority of those commenting highlighted the need to provide for adequate time for public comment. 8. Keeping to the Agenda / Staying on Topic. We received comments from 38 individuals who mentioned the importance of keeping to the agenda and staying on topic. Totals come to more than 100% since respondents could provide up to three comments. From left to right, columns show percentage of comments relating to: Being Prepared; Notifying the Public; Explaining the Process; Role of the Chairperson; Showing Respect; Listening to the Public; Public Comments; and Keeping to the Agenda. We also received other groupings of comments -- which we'll mention near the end of the post -- about the importance of: following ordinance criteria; meeting time and location; planning commissioner education and training; and following rules of order during meetings. Editor's Note: If you haven't yet read them, I would highly recommend you take a look at the late Fred Riggins' insightful suggestions for how planning commissioners (and others) should conduct themselves at public hearings. See "The Riggins Rules: Suggested Do’s & Don'ts for the Conduct of Public Hearings and the Deportment of Members of Boards, Commissions, & Other Bodies. Our question asked planners and planning commissioners to identify up to three keys to holding effective public meetings. A very large number of individuals (136 of the 379 responding) mentioned things which related closely to getting prepared for the meeting. The most common refrain -- mentioned by 72 individuals in their comments -- was the importance of planning commissioners spending the time to read through the information on all the agenda items before the meeting. As a plan commissioner from Indiana wrote: "Know the agenda items prior to coming to the meeting and view properties being discussed so you know what you are dealing with. BE PREPARED." 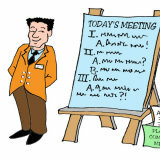 A number of comments were short and to the point, like "prepare before the meeting" and "come to meetings well-prepared. A bit more bluntly, a Nebraska planning commissioner noted that it "would help if members actually read the meeting agenda prior to sitting down at meeting." Read the packet ahead of the meeting. Many comments were straightforward, like "read the packet ahead of the meeting" and "review staff reports prior the meeting." Several individuals stressed the importance of getting meeting packets to board members in advance. A Vermont respondent who has served as a planner and a planning commissioner wrote that staff should "provide background materials, including context, on items to be discussed." Several focused on the need to develop "a concise agenda" or "a workable agenda." Half a dozen individuals highlighted the help staff can provide to commissioners before meetings. Contact staff with clarifying questions prior to the meeting. A planner from Alaska suggested that commissioners "contact staff with clarifying questions prior to the meeting." Similarly a planner from New Mexico noted that "Commissioners need to review the materials before hand, and ask staff for clarification or additional materials well in advance of the hearing." In terms of meeting preparation, nine comments noted the value for planning commissioners to do site visits in advance of the meeting. Two examples of these comments: a Texas planning commissioner said, "Visit the sites to have basic knowledge of the surrounding neighborhoods," while a Virginia planner noted, "Create opportunities for planning commissioners to visit site with staff." 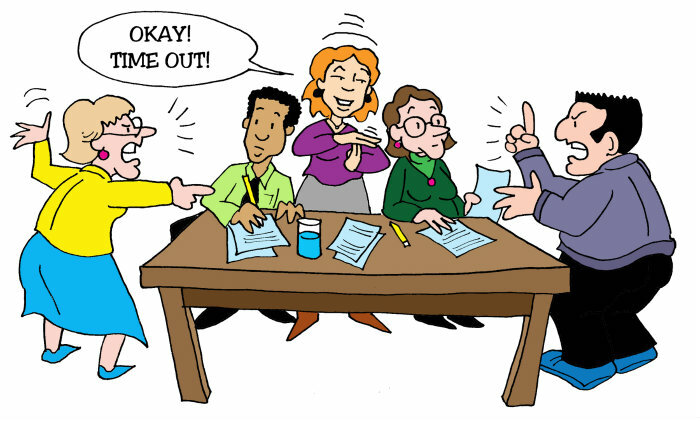 Editor's note: While site visits are a quite important part of meeting preparation, they can also lead to complaints from members of the public about ex-parte contacts between commissioners and property owners. We've run two articles that touch on this issue: Greg Dale's "Site Visits: Necessary, But Tricky," and part two of Alan Weinstein's "Avoiding Open Meeting Law Violations." A large number of those responding (92 individuals) mentioned the importance of good public notice as a key element to holding an effective public meeting. Many of these comments were brief, like: "get the word out," "give public better notice of meetings," and "publicize meeting purpose." A few commented on the benefit of having good posted notice signs. One respondent from Alaska offered an interesting perspective on why public outreach is important: "Public outreach is crucial in having people come out of the woodwork to address a planning issue so that a commission can balance out both sides of an argument." In the previous section we cited comments about the importance of providing planning commissioners with the agenda and meeting packets in advance. An Idaho planner pointed out that it's not just planning commissioners who should be receiving this kind of information: "Provide as much material as possible prior to the meeting so the public has time to review and make meaningful comments." Notify the public in as many ways as possible, including social media sites. Several recommended making documents available not just at the hearing, but online. Others mentioned the value of using the web and social media: "Notify the public in as many ways as possible, including social media sites," said a planning commissioner from Virginia. A Minnesota planner suggested providing information on posted notices about projects by "using QR codes 1 to link to project information." Provide factual information in advance to quell rumors. As a planner from Idaho wrote, notifying the public means providing "as much material as possible prior to the meeting so the public has time to review and make meaningful comments." Another benefit noted by a Texas planner: "Provide factual information in advance to quell rumors." Several comments also focused on more long-term strategies for getting people engaged. A Missouri planner commented on the need to "develop a public engagement plan," while a planning board member from Massachusetts wrote, "Create capacity for typically underrepresented groups to participate more effectively." Show Up ... and ... Be on Time. A West Virginia planning commissioner summed up in two words what's perhaps the most important piece of advice for a planning commissioner: "Show Up." And when you show up, said a Michigan planning commissioner, "be on time." And don't forget, as a planning commissioner from Pennsylvania observed, the importance of "Starting promptly and moving along without games." One issue we've highlighted in the Planning Commissioners Journal over the years is the significance of the very start of the meeting in explaining the meeting rules and process, and in creating a welcoming atmosphere for members of the public. In fact, 32 individuals mentioned the importance of providing these explanations at the beginning of a meeting. A planning commissioner from Washington State noted, "be welcoming and appreciative" -- while also suggesting the value of "offering refreshments." Provide clear instructions of how to participate and what to expect since for many it is the first interaction with local government. "Provide clear instructions of how to participate and what to expect since for many it is the first interaction with local government," wrote a planner from New York. A planner from Virginia put it this way, "Provide enough information as part of the intro to the public hearing that the item is clear to the public what is being discussed." An additional five comments noted the importance of having adequate copies of agenda, handouts, and other materials. As another Virginia planner noted, "Anticipate the crowd and have adequate agendas and information packets," while a planning board member from Massachusetts wrote, "Distribute written materials to all attending." Comments from 34 individuals specifically mentioned the key role the chair of the planning commission plays. 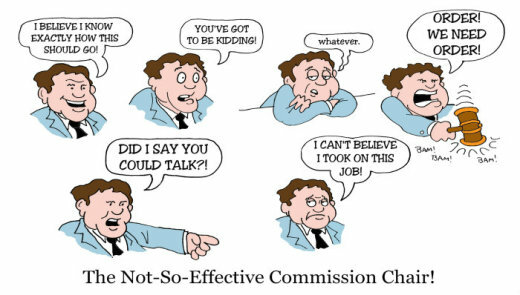 One common refrain: "recruit a very skillful chairperson!," "select/elect a capable chair." Strong chair leadership to curb digressions. Commenters often stressed the chair's role in controlling the meeting, and keeping to the agenda. As a Minnesota planner said, "Effective chairman to keep the meeting on track," while a planner from Colorado wrote, "Strong chair leadership to curb digressions." Note, we have a separate section below "Keep to the Agenda" -- many comments on the need to keep to the agenda did not explicitly mention the chair's role in this, and were not included in the number of responses mentioned in the previous paragraph, though it's usually the chair who has primary responsibility for keeping the meeting on track. Editor's Note: For more on the role of the Chair, see Elaine Cogan's Leading the Commission, and Carol Whitlock's Chairing the Planning Commission. Some 37 of those responding mentioned the importance of showing respect -- and good manners -- to those attending the commission meetings. In fact the word "respect" or "respectful" showed up in 21 responses. Other responses used similar words, like "civil," "fair," and "courteous." "Be courteous to the public," noted a Louisiana planning commissioner/planner, and "be kind and civil to all testifiers," said a planner from Hawaii. A planning commissioner from Alaska wrote, "Treat people with respect when they testify, do not grill them." Maintain a fair, open, and respectful forum. A Kansas planning commissioner highlighted the importance of "making sure citizens feel as welcome as applicants," while a planning board member from South Dakota wrote, "Maintain a fair, open, and respectful forum." We also included under "Respect & Decorum" seven comments which mentioned the importance of being "transparent" as part and parcel of showing respect. Another way of showing respect is by keeping order and decorum in the meeting room. We received comments from 17 survey respondents that related to this. As a planner from Washington State said, "Create a non-threatening atmosphere that encourages public comments." Don't allow for intimidation of any kind at the meetings. Similarly, a California planner noted, "Don't allow for intimidation of any kind at the meetings," while a planning commissioner from Montana observed, "Don't let bullies dominate or drown out anyone." A specific suggestion from a Virginia planner on decorum, "Do not allow crowd to clap or boo on controversial topics." Listening to the public was mentioned by 39 individuals one of the three most important things to do in order to hold an effective public meeting or hearing. Remember that you represent the community and not your own personal views. Many replies were short, like: "Listen carefully to those testifying;" "Listen more than speak;" "Be patient and listen to the public;" "Listen, don't argue;" and "Genuinely listen to what is being said." An elected official from Washington State seemed to best sum up what we heard in three words: "Listen, Listen, Listen." Implicit in the act of listening, and specifically mentioned by nine other individuals, is the importance of keeping an open mind. As an Indiana plan commissioner put it: "Stay calm and keep an open mind. Remember that you represent the community and not your own personal views." Eighty-four individuals indicated that receiving public comments was one of the most important things to running an effective meeting. A majority of those commenting highlighted the need to provide for adequate time for public comment (for example: "offer ample time for public comment," "give public opportunity to weigh in," and "give everyone a chance to speak"), while a few respondents focused more on the need to limit the time for public comments. Make sure everyone has an opportunity to express their opinion, but ensure that the same points aren't being repeated over and over. One point that several stressed was the need to balance the opportunity to speak with keeping the meeting on schedule. A Pennsylvania planning commissioner commented, "Make sure everyone has an opportunity to express their opinion, but ensure that the same points aren't being repeated over and over," while a planner from Texas wrote, "allow pertinent public comment, but do not allow the public to veer off the agenda." A Washington planner advised "giving everyone a chance to speak before allowing those who already had a speaking opportunity" to talk again. How much time should be allowed for public comments? That's something several commented on in their replies. Five individuals specifically recommended sticking to a three minute limit, four others more generally noted the need to "limit time for public speaking." But others had a different view. An Illinois planning commissioner wrote, "Don't set time limits for comments," while a planning board member from Massachusetts cautioned to "Avoid hurrying a meeting to 'get out of there.'" There was also this suggestion from an Ohio planner (echoed by several others): "Collect all public comments and questions before responding to any of them." In the preceding section we noted a comment about not allowing the meeting to veer off the agenda. In fact, 38 individuals specifically mentioned the importance of keeping to the agenda and staying on topic. Most of these comments were brief, like: "Stay on agenda and on time," and "Have an agenda and stick to it." As a planning commissioner from Washington State put it, "Keep the meeting on topic -- reduce chit chat -- not a social event." We also received this advice from a California planner: "Manage the agenda so that non-controversial projects can get out quickly and time can be spent on the most challenging items." We received a half dozen comments that mentioned the value of meetings in advance of formal public hearings. An Oregon planner said, "Require pre-application neighborhood meeting by applicant to be held, while a planner from New York noted "Encourage developers to meet with public before a formal public hearing." A Virginia planning commissioner suggested that commissions hold "work sessions" prior to a public hearing. 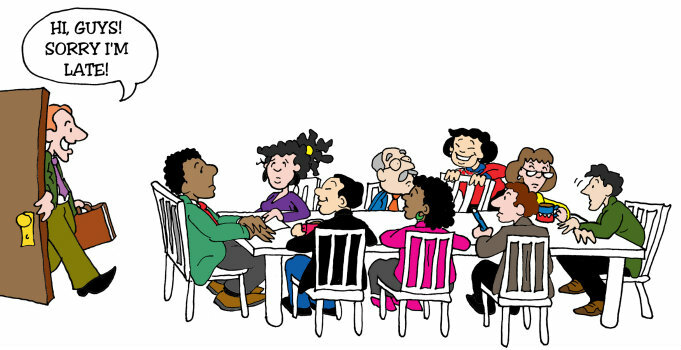 Four individuals commented on the importance of having meeting times convenient for the public, while two people suggested evening instead of day time meetings. We also heard from several people about the importance of the meeting room location and how it's set up for a meeting -- considerations sometimes not given enough attention. Among the suggestions: "Have adequate sound systems and/or room acoustics;" "Microphones so all can hear!" and "Display maps/graphics prominently." Change format of room so it's not like a panel of judges. One other comment worth thinking about, in this case from a Vermonter: "Change format of room so it's not like a panel of judges ... typical hearing discourages attendance and speaking up." Twenty individuals commented on the importance of planning commissioner training and education. We didn't include these comments when we spoke earlier about meeting preparation since these comments focused on a longer-term approach, not preparation for a specific meeting (which the earlier mentioned comments related to). A Kansas planner, for example, noted the importance of "providing training to the Planning Commission Chair on effective meeting running," while a planner from Mississippi recommended "orientation for new planning commission members." Several comments also mentioned the value for planning commissioners to be familiar with the local ordinance or land development code requirements. Several individuals also reported that one important aspect of holding an effective meeting involves sticking to your ordinance's or code's criteria. "Make decisions based on the duly-adopted ordinances of the community," said a planner from Maine. Similarly an Oregon planner wrote that, "Commission members must put their own values aside and apply the facts to the criteria and render a decision." Just because you don't like it, isn't a reason to deny a project. A Montana planner put it this way: "Just because you don't like it, isn't a reason to deny a project," while a planner from Hawaii said: "Clarify and re-clarify the purpose of the hearing and basis for decision-making." We received six comments noting the importance of following rules of order. As a local official from Colorado wrote, "Observe Robert's Rules of order; speak in order instead of a back and forth chatter mode." Interestingly, a Washington planner suggested as important maintaining a "very informal atmosphere even though Robert's Rules are used," while a planner from Texas said, "Set clear and easy to understand rules of order." Editor's note: We've periodically received emails about the use of rules of order during planning commission meetings or hearings. Some years ago we published two excellent articles by the David Allor (since deceased), a planner who taught at the University of Cincinnati, about modifying Robert's Rules of Orders for easier use by planning commissions. We strongly urge you to download and read Allor's "The Commission Will Come to Order," and also his related article, "Keeping Things in Order: Planning Commission Model By-Laws." "Avoid reactionary decision making based upon one or two upset citizens." "Don't speak in acronyms," and "don't assume your audience knows terms." "Be professional. Take off the 'friends' hat." "Have necessary staff from other departments to respond to technical questions." "Make sure there is enough information to make a good choice." "Make timely decisions instead of kicking the bucket down the road." "Work very hard to avoid group think." "Provide a range of ways for people to share their ideas." 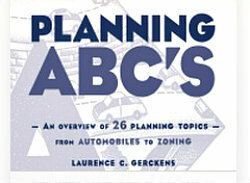 -- What Counts Most as a Planning Commissioner?